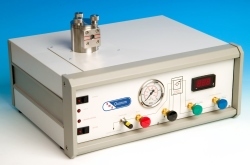 The EMS 850 Critical Point Dryer is designed for use with CO2, having first replaced any water in the specimen by a series of dehydration, often in the same fluid such as Acetone, which will also be the intermediate fluid. 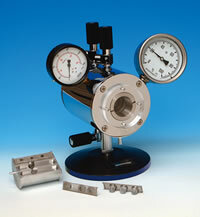 The specimens for critical point drying are located in the pressure chamber of the EMS 850. The chamber is pre-cooled to allow it to be readily filled with liquid CO2 from a gas cylinder. The chamber is then heated to just above the critical temperature with subsequent critical pressure being achieved. 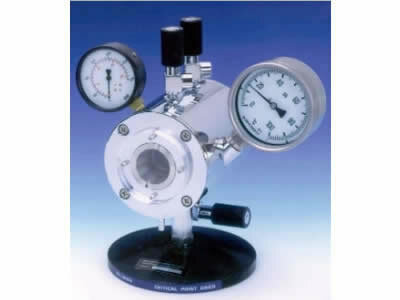 The CO2 gas is vented through a needle valve, to avoid specimen distortion. The EMS 850 is fitted with thermoelectronic Heating and Cooling and Temperature control of +5°C on Cooling, and +35°C on Heating. This ensures the critical point is accurately obtained, avoiding excess pressures or temperatures, or the need to rely on pressure relief valves to control pressure during the heating cycle. The chamber is vertical, with top loading, to ensure specimens do not become uncovered during the drying process, with a side viewing port to locate the miniscus for the correct level when initially filling the chamber. 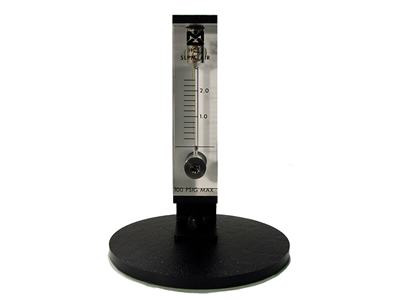 The EMS 850 is fitted with a fine let down needle as standard and flow gauge is no longer required. A separate flow meter is available if your application requires highly accurate monitoring and/or flow control. 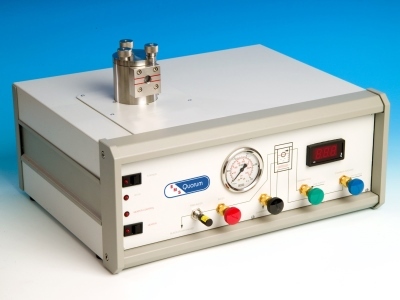 The EMS 850WM is compact, benchtop instrument designed to critical point dry a complete 150mm/6" wafer. 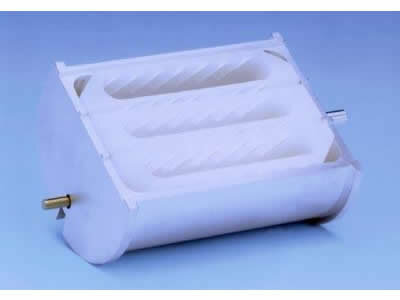 A convenient wafer holder allows rapid transfer and ensures that pre-drying does not occur. The EMS 850WM has built-in heating and water cooling using the EMS 4860 Recirculating Heater/Chiller. This combination will give temperature control of +5°C cooling and +35°C during heating. This ensures the critical point is accurately obtained, avoiding excess pressures or temperatures, or the need to rely on pressure relief valves to control pressure during the heating cycle. 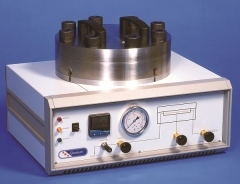 The EMS 850WM has a vertical chamber which allows top-loading of specimens. A viewing port is fitted in the top plate for specimen observation. The specimen exchange mechanism is simple to use and ensures the specimen remains under liquid during loading. 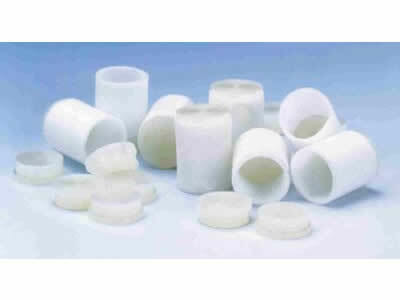 100mm or 150mm diameter wafers are held in a PTFE holding tray. The tray including wafer is immersed in acetone in order to remove all moisture from the specimen. After dehydration, the wafer and holder are transferred into the pre-cooled specimen chamber using the wafer transfer device. On completion of the critical point drying process, the wafer is removed from the chamber using the transfer device prior to further processing. Where increased chamber volume is required, for either size or quantity of specimens to be dried, the large capacity model EMS 3100 is available. The chamber dimensions are 63.5mm internal diameter x 82mm in length, giving approximately three times the volume of the EMS 3000. The transfer boat will also accept three times the number of specimen baskets. Dial gauges display pressure in the chamber and the temperature of water circulating through the jacket. 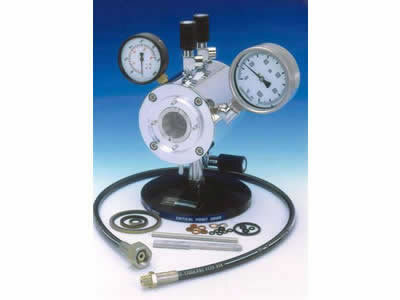 Three pressure valves permit easy connection to the liquid CO2 cylinder and allow liquid agitation and venting of the chamber. A source of hot running water is essential. Cooling is also useful, especially for sequential process runs or in hot climates. The temperature of the EMS 3100 chamber is raised with a hot water supply. Mains water can be used but a more elegant method involves the use of the optional EMS 3500 Thermocirculator, which is connected directly to the inlet and outlet of the water jacket. The temperature of the circulatory fluid can be pre-set (eg at 37°C, just above the critical temperature). A second alternative is the model EMS 4860 Recirculating Heater/Chiller, which can be used to pre-cool the chamber to below ambient prior to loading specimens and then to heat the chamber to the critical temperature. Safety is, of course, an important consideration with all pressure vessels. Should critical pressure and temperature be inadvertently exceeded, a bursting disc is incorporated in the chamber support. The critical point drying chamber itself is tested to 2,500psi, which is approximately twice the working pressure. A guard is also fitted over the viewing window. An important feature is the design of the transfer boat. This permits specimens in the intermediate fluid to be transferred to the critical point dryer. On sealing the chamber, the intermediate fluid begins to drain and can be replaced with liquid CO2. In this way the specimens are never allowed to dry out during the specimen loading and transfer stage of the process. The EMS 3100 is supplied with a standard tissue holder (boat). The EMS 3100 is supplied with the EMS 3100-01 tissue boat and has three slots each with three tissue baskets, making a total of nine tissue baskets. Other choices of holders are listed below under Options and Accessories. Bonded chamber seals – Nitrile or EPDM? EMS 3100 is fitted with a standard with nitrile bonded window and door seals. Nitrile is a good general material due to its ability to withstand attack by solvents, such as ethanol. However, if acetone is used as the transition fluid then the EPDM seals have been found to be more resistant to chemical attack by that solvent. If you are ordering an EMS 3100 and are planning to use acetone as the transition fluid, please state this on the order and EPDM bonded seals will be fitted. 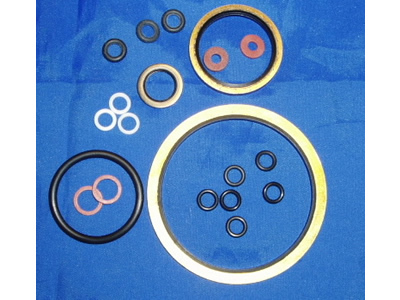 For existing instruments, both Nitrile and EPDM bonded seal can be ordered as spare parts. 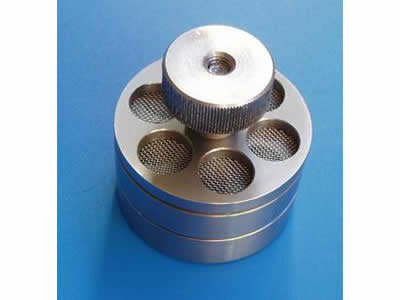 Glass microscope coverslip holder (option): Specially adapted boats allow glass coverslips to be held firmly during drying. 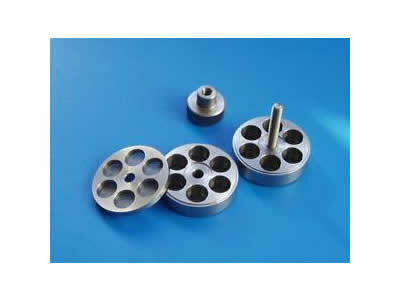 The EMS 3000-02 is designed for the EMS 3000 and has a maximum capacity of seven coverslips. Likewise, the larger EMS 3100-02 coverslip boat is available for the EMS 3100 'Jumbo' Critical Point Dryer and has a carrying capacity of 21 coverslips. 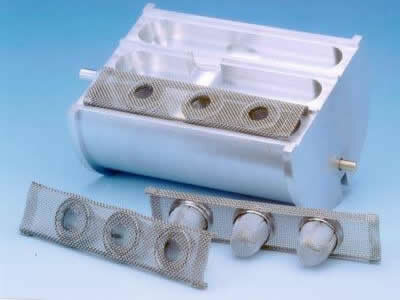 TEM grid holder (option): The EMS 3000-1 holder for 3.05mm grids and the EMS 3000-2 grid holder for 2.3mm grids can be used with all Electron Microscopy Sciences critical point dryers. Maximum number of grids is three. Porous pots with lids (option): EMS 800A solvent-resistant porous pots (12.7mm x 15.5mm) with lids are ideal for very small or very delicate specimens. Service kits are available for both the EMS 3000 and EMS 3100; see the ordering table below. Please call our service department for specific questions. CO2 Cylinder: The EMS 3000 and EMS 3100 require a cylinder of liquid CO2 fitted with a siphon tube (indicated by a vertical white stripe on the cylinder). If there is any doubt regarding the presence of a siphon tube, advice should be sought from the gas supplier. 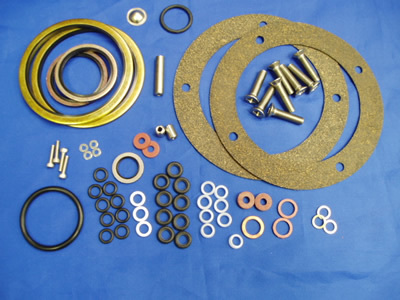 Cylinder connection threads vary from country to country and even between manufacturers in the same country. For example, the transfer pipe supplied is fitted with ¼" British Standard Pipe (BSP) and 0.86" x 14 TPI union. These are standard threads for the UK and generally in the rest of the world, but will not fit cylinders in the USA. 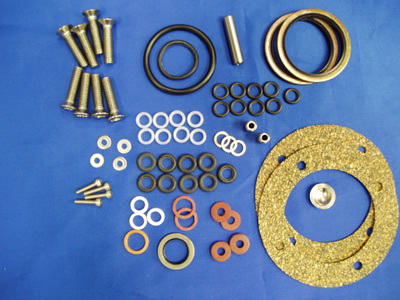 An EMS 3000-US kit should be specified for use within the USA; this includes a transfer pipe adaptor which will fit USA cylinders. If it is deemed necessary to fabricate another transfer pipe, advice should be sought from a local supplier of high-pressure fittings. Heating and cooling: Use a mixer to the laboratory hot and cold water outlets, terminating with a 6mm/¼" hose connection for the PVC tubing supplied. 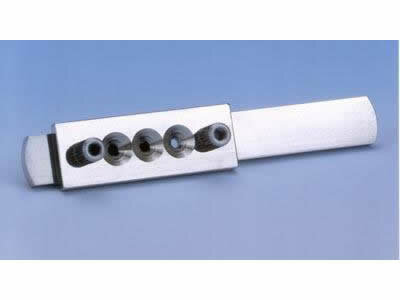 A 'Y' piece connected to the hot and cold water taps is also suitable. The EMS 3000 and EMS 3100 require both hot and cold water during the operating cycle. Cooling facilitates filling of the work chamber with liquid CO2, and heating is required to take the liquid above its critical point. Good control of the water temperature is essential for good results, hence the recommended use of the EMS 3500 Thermocirculator or, more conveniently, the EMS 4860 Recirculating Heater/Chiller which gives precise control of cooling and heating. Space requirement: A minimum bench space of approximately 230 x 230mm is required.